The painting was created in 1984 inspired by a visit to Israel. 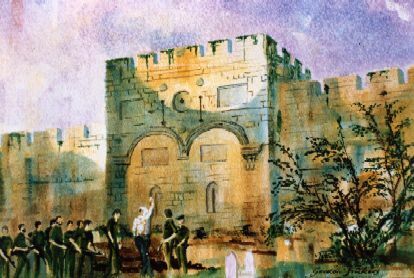 It shows young men on national service with a guide who is explaining the significance of the eastern gate of Jerusalem. The Muslims blocked the east gate because an ancient legend prophesies the Messiah will enter the city of Jerusalem via the East gate. The gate remains blocked to this day. The Muslim name of the gate is Bab al-Dhahabi. The North portal is known as Bab al-Tawba, the Gate of Repentance, and the Southern Portal, Bab al-Rahma, the Gate of Mercy. It is a fine example of a now-closed double gate. On June 7 1967 the Israeli army entered and recaptured Jerusalem from the Jordanians who had seized the city in 1948 when the British evacuated, driving out the Jews and desecrating their holy places. The Israeli troops first re entered Jerusalem via the tiny and ironically named ‘Dung Gate’. I spoke with one of the veterans who said, ‘it was extraordinary, usually street fighting is the bloodiest but that time is was easy, it was as if every bullet we fired hit it’s target, we could not miss‘. That gallant action returned control of the ancient city of Jerusalem to the Jewish people for the first time in 1,897 years. Suleiman the Great ( a Turkish Muslim) decided to put an end to Jewish hopes by ordering the Eastern Gate sealed. He also put a Muslim cemetery in front of the Gate, believing that no Jewish holy man would defile himself by walking through a Muslim cemetery. The Gate has remained sealed since that time. A Muslim cemetery still blocks the entrance. An ancient Jewish burial area much vandalized by Muslims covers the eastern Temple Mount and Mount of Olives hillside up to and surrounding the Golden Gate. Ezekiel 44. The context is a supernatural tour the Lord is giving Ezekiel of the future Millennial Temple (40:1-3). In chapter 43 the Lord gives Ezekiel a vision of God’s glory entering the Millennial Temple from the east, through the Eastern Gate. The Lord then says to Ezekiel: “Son of Man, this is the place of My throne and the place of the soles of my feet where I will dwell among the sons of Israel forever” (43:7). The Lord then reveals to Ezekiel that the Eastern Gate will be closed and will not be reopened until the Messiah returns in glory (44:1-3). The New Testament states Jesus rode a donkey from the Mount of Olives down into the Kidron Valley and up to the Eastern Gate where He entered the Temple Mount for His last days of teaching. The Valley of Kidron was filled with thousands of admirers who had heard about the resurrection of Lazarus. We are told in Revelation 19 that when the Messiah returns He will come as a victorious military conqueror, riding through the air on a supernatural white horse. In Isaiah 61 we are told that He will come from the east, and in Zechariah 14 we are told that he will touch ground on the Mount of Olives. Many Christians and Orthodox Jews have vehemently protested the idea of re opening the gate, saying that “the Eastern Gate can be opened only when the Messiah comes”. Inadvertently the radical Muslims have done their enemies a favour! The Gate awaits the return of the Messiah. Only then will The gate of Prophecy be opened. I told you this would happen. You called me ‘extremist’. I am not an extremist. I am a liberal with my eyes and ears open. There will be worse, look around the world. It’s happening and coming to you.